Consensus decision-making is a group decision making process that seeks the agreement of most participants, and also the resolution or mitigation of minority objections. The word “consensus” itself is commonly used to refer to two different concepts, which sometimes leads to confusion about what is actually meant by “consensus”. The one meaning of “consensus” signifies general agreement, regardless of the process by which such agreement is determined. It refers simply to fact of such agreement, not to any particular procedure or set of rules. Consensus decision-making, the topic of this article, refers to a particular process for arriving at decisions. While not as common as other decision-making procedures, such as democracy, consensus decision-making has been used by a wide variety of groups, from religious such as the Quakers, to economic such as the Dutch Polder Model (a process that brings corporations, government, and labour leaders together), and the Hanseatic League (an alliance of cities run by merchant guilds), to political such as Food Not Bombs, some non-governmental organizations, as well as the Haudenosaunee (Iroquois) nation. Because consensus decision-making allows a minority to block the will of the majority, it has been adopted by a number of international bodies where there is a danger that a majority of small countries could out-vote the major powers. The European Union's Treaty of Lisbon provides in art. 15 (4) that the European Council shall take decision by consensus. Critics charge that this is designed to block any attempts to change the capitalist goals and structures of the European Council. The NATO (North Atlantic Treaty Organization) military council also operates on the basis of consensus. In both cases, since consensus decision-making requires unanimity to make any changes, it can be employed to prevent change desired by the majority, and to thwart democratic input into decisions. Cooperative: Participants in an effective consensus process should strive to reach the best possible decision for the group and all of its members, rather than opt to pursue a majority opinion, potentially to the detriment of a minority. Egalitarian: All members of a consensus decision-making body should be afforded, as much as possible, equal input into the process. All members have the opportunity to present, amend and veto or "block" proposals. Solution-oriented: An effective consensus decision-making body strives to emphasize common agreement over differences and reach effective decisions using compromise and other techniques to avoid or resolve mutually-exclusive positions within the group. Most Logical: This happens when a solution appears to be impossible to execute because of the lack of support and cooperation. Proponents of consensus decision-making view procedures that use majority rule as undesirable for several reasons. Majority voting is regarded as competitive, rather than cooperative, framing decision-making in a win/lose dichotomy that ignores the possibility of compromise or other mutually beneficial solutions. Carlos Santiago Nino, on the other hand, has argued that majority rule leads to better deliberation practice than the alternatives, because it requires each member of the group to make arguments that appeal to at least half the participants. A. Lijphart reaches the same conclusion about majority rule, noting that majority rule encourages coalition-building. Proponents of consensus argue that majority rule can lead to a 'tyranny of the majority'. However, proponents of democratic decision-making argue that majority rule may actually prevent tyranny of the majority, in part because it maximizes the potential for a minority to form a coalition that can overturn an unsatisfactory decision. They also point out the democratic decisions prevent minority rule, whereas consensus decision-making can frequently result in minority rule, when one or more individuals or a small vocal group block the will of the majority of the group. Advocates of consensus claim that a majority decision reduces the commitment of each individual decision-maker to the decision. Members of a minority position may feel less commitment to a majority decision. The result of this reduced commitment, according to many consensus proponents, is potentially less willingness to defend or act upon the decision. Since the consensus decision-making process is not as formalized as others (see Roberts Rules of Order), the practical details of its implementation vary from group to group. However, there is a core set of procedures which is common to most implementations of consensus decision-making. Call for consensus: The facilitator of the decision-making body calls for consensus on the proposal. Each member of the group usually must actively state their agreement with the proposal, often by using a hand gesture or raising a colored card, to avoid the group interpreting silence or inaction as agreement. Modification of the proposal: The proposal is amended, re-phrased or ridered in an attempt to address the concerns of the decision-makers. The process then returns to the call for consensus and the cycle is repeated until a satisfactory decision is made. The consensus decision-making process often has several roles which are designed to make the process run more effectively. Although the name and nature of these roles varies from group to group, the most common are the facilitator, a timekeeper, an empath and a secretary or notes taker. Not all decision-making bodies use all of these roles, although the facilitator position is almost always filled, and some groups use supplementary roles, such as a Devil's advocate or greeter. Some decision-making bodies opt to rotate these roles through the group members in order to build the experience and skills of the participants, and prevent any perceived concentration of power. Unanimity minus one (or U-1), requires all delegates but one to support the decision. The individual dissenter cannot block the decision although he or she may be able to prolong debate (e.g. via a filibuster). The dissenter may be the ongoing monitor of the implications of the decision, and their opinion of the outcome of the decision may be solicited at some future time. Unanimity minus two (or U-2), does not permit two individual delegates to block a decision and tends to curtail debate with a lone dissenter more quickly. Dissenting pairs can present alternate views of what is wrong with the decision under consideration. Pairs of delegates can be empowered to find the common ground that will enable them to convince a third, decision-blocking, decision-maker to join them. If the pair are unable to convince a third party to join them, typically within a set time, their arguments are deemed to be unconvincing. Unanimity minus three, (or U-3), and other such systems recognize the ability of four or more delegates to actively block a decision. U-3 and lesser degrees of unanimity are usually lumped in with statistical measures of agreement, such as: 80%, mean plus one sigma, two-thirds, or majority levels of agreement. Such measures usually do not fit within the definition of consensus. Rough Consensus is a process with no specific rule for "how much is enough." Rather, the question of consensus is left to the judgment of the group chair (an example is the IETF working group, discussed below). While this makes it more difficult for a small number of disruptors to block a decision, it puts increased responsibility on the chair, and may lead to divisive debates about whether rough consensus has in fact been correctly identified. Block: Any group member may "block" a proposal. 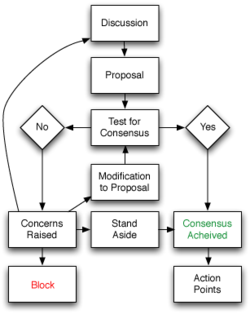 In most models, a single block is sufficient to stop a proposal, although some measures of consensus may require more than one block (see previous section, "Non-unanimous or modified consensus"). Blocks are generally considered to be an extreme measure, only used when a member feels a proposal "endanger[s] the organization or its participants, or violate[s] the mission of the organization" (i.e., a principled objection). In some consensus models, a group member opposing a proposal must work with its proponents to find a solution that will work for everyone. Consensus decision-making reflects the cultural bias of white middle-class university-educated people: The consensus process is not neutral: it is means by which working class and non-white people can be excluded from effective participation. Rebecca Solnit in her book A Paradise Built in Hell describes the conflicts that resulted when young white middle-class activists who came to New Orleans in the aftermath of Hurricane Katrina to help with the rebuilding attempted to impose consensus decision-making on the local residents groups they were supposed to be assisting. Al Giordano suggests that consensus is popular in groups formed by "college educated Americans" precisely because the process guarantees that their group will remain homogenous and narrow, by screening out anyone who doesn’t belong to this demographic. Consensus decision-making is anti-democratic: Groups working for radical social change, that is, the abolition of capitalism and its replacement by grassroots democracy, are acting against their own supposed goals, according to Ulli Diemer, when they reject democratic decision-making, since radical democracy can only be created with the methods of radical democracy. Perhaps the oldest example of consensus decision-making is the Iroquois Confederacy Grand Council, or Haudenosaunee, who have traditionally used consensus in decision-making, potentially as early as 1142. Examples of consensus decision-making can likely be found among indigenous peoples, such as the African Bushmen. Although the modern popularity of consensus decision-making in Western society dates from the women's liberation movement and anti-nuclear movement of the 1970s, the origins of formal consensus can be traced significantly farther back. The most notable of early Western consensus practitioners are the Religious Society of Friends, or Quakers, who adopted the technique as early as the 17th century. The Anabaptists, or Mennonites, too, have a history of using consensus decision-making and some believe Anabaptists practiced consensus as early as the Martyrs' Synod of 1527. Some Christians trace consensus decision-making back to the Bible. The Global Anabaptist Mennonite Encyclopedia references, in particular, Acts 15 as an example of consensus in the New Testament. Quaker-based consensus relies on a simple, time-tested structure that moves a group towards unity. Though it works best in the context of shared religious beliefs, the Quaker model has been employed in a variety of secular settings as well. The process allows for individual voices to be heard while providing a mechanism for dealing with disagreements. Differences are resolved by discussion. The facilitator ("clerk" or "convenor" in the Quaker model) identifies areas of agreement and names disagreements to push discussion deeper. Key components of Quaker-based consensus include a belief in a common humanity and the ability to decide together. The goal is "unity, not unanimity." Ensuring that group members speak only once until others are heard encourages a diversity of thought. The facilitator is understood as serving the group rather than acting as person-in-charge. In the Quaker model, as with other consensus decision-making processes, by articulating the emerging consensus, members can be clear on the decision, and, as their views have been taken into account, will be likely to support it. In the Internet Engineering Task Force (IETF), decisions are assumed to be taken by "rough consensus". The IETF has refrained from defining a mechanical method for verifying such consensus, apparently in the belief that any such codification will lead to attempts to "game the system." Instead, a working group (WG) chair or BoF chair is supposed to articulate the "sense of the group." Consensus decision-making models overlap significantly with deliberative methods, which is the name academics such as political scientists use to describe consensus models. Red: During discussion, a red card is used to indicate a point of process or a breach of the agreed upon procedures. Identifying off-topic discussions, speakers going over allowed time limits or other breaks in the process are uses for the red card. During a call for consensus, the red card indicates the member's opposition (usually a "principled objection") to the proposal at hand. When a member, or members, use a red card, it becomes their responsibility to work with the proposing committee to come up with a solution that will work for everyone. Yellow: In the discussion phase, the yellow card is used to indicate a member's ability to clarify a point being discussed or answer a question being posed. Yellow is used during a call for consensus to register a stand aside to the proposal or to formally state any reservations. Green: A group member can use a green card during discussion to be added to the speakers list. During a call for consensus, the green card indicates consent. Some decision-making bodies use a modified version of the colored card system with additional colors, such as orange to indicate a non-blocking reservation stronger than a stand-aside. Hand signals are often used by consensus decision-making bodies as a way for group members to nonverbally indicate their opinions or positions. Although the nature and meaning of individual gestures varies from group to group, there is a widely-adopted core set of hand signals. These include: wiggling of the fingers on both hands, a gesture sometimes referred to as "twinkling", to indicate agreement; raising a fist or crossing both forearms with hands in fists to indicate a block or strong disagreement; and making a "T" shape with both hands, the "time out" gesture, to call attention to a point of process or order. One common set of hand signals is called the "Fist-to-Five" or "Fist-of-Five". In this method each member of the group can hold up a fist to indicate blocking consensus, one finger to suggest changes, two fingers to discuss minor issues, three fingers to indicate willingness to let issue pass without further discussion, four fingers to affirm the decision as a good idea, and five fingers to volunteer to take a lead in implementing the decision. Another common set of hand signals used is the "Thumbs" method, where Thumbs Up = agreement; Thumbs Sideways = have concerns but won't block consensus; and Thumbs Down = I don't agree and I won't accept this proposal. This method is also useful for "straw polls" to take a quick reading of the group's overall sentiment for the active proposal. Dotmocracy sheets are designed to compliment a consensus decision-making process by providing a simple way to visibly document levels of agreement among participants on a large variety of ideas. Participants write down ideas on paper forms called Dotmocracy sheets and fill in one dot per sheet to record their opinion of each idea on a scale of strong agreement , agreement , neutral , disagreement , strong disagreement or confusion . Participants sign each sheet they dot and may add brief comments. The result is a graph-like visual representation of the group's collective opinions on each idea. The Step-by-Step Process and Rules defined in the Dotmocracy Handbook reinforce consensus decision-making by promoting equal opportunity, open discussion, the drafting of many proposals, the identification of concerns and the encouragement of idea modification. ^ a b Rob Sandelin. "Consensus Basics, Ingredients of successful consensus process". Northwest Intentional Communities Association guide to consensus. Northwest Intentional Communities Association. http://www.ic.org/nica/Process/Consensusbasics.htm#Ingredients. Retrieved 2007-01-17. ^ Dressler, L. (2006). Consensus Through Conversation How to Achieve High-Commitment decisions. Berkeley, CA:Berrett-Koehler. ^ Friedrich Degenhardt (2006). "Consensus: a colourful farewell to majority rule". World Council of Churches. http://www.oikoumene.org/en/news/news-management/all-news-english/display-single-english-news/browse/4/article/1634/consensus-a-colourful-fa-1.html. Retrieved 2007-01-17. ^ a b Anthony J. McGann (2002). "The Tyranny of the Supermajority: How Majority Rule Protects Majorities" (PDF). Center for the Study of Democracy. http://repositories.cdlib.org/cgi/viewcontent.cgi?article=1001&context=csd. Retrieved 2008-06-09. ^ a b c C.T. Lawrence Butler; Amy Rothstein. "On Conflict and Consensus". Food Not Bombs Publishing. http://www.consensus.net/ocac2.htm. Retrieved 2007-01-17. ^ "What is Consensus?". The Common Place. 2005. http://www.thecommonplace.org.uk/information.php?page=articles&iID=4. Retrieved 2007-01-17. ^ "The Process". Consensus Decision Making. Seeds for Change. 2005-12-01. http://seedsforchange.org.uk/free/consens#proc. Retrieved 2007-01-17. ^ a b Sheila Kerrigan (2004). "How To Use a Consensus Process To Make Decisions". Community Arts Network. http://www.communityarts.net/readingroom/archivefiles/2004/09/how_to_use_a_co.php. Retrieved 2007-01-17. ^ a b Lori Waller. "Guides: Meeting Facilitation". The Otesha Project. http://www.otesha.ca/bike+tours/guides/meeting+facilitation.en.html#toc_putting_on_your_facilitator_hat. Retrieved 2007-01-17. ^ Berit Lakey (1975). "Meeting Facilitation --The No-Magic Method". Network Service Collaboration. http://www.reclaiming.org/resources/consensus/blakey.html. Retrieved 2007-01-17. ^ Richard Bruneau (2003). "If Agreement Cannot Be Reached" (DOC). Participatory Decision-Making in a Cross-Cultural Context. Canada World Youth. pp. 37. http://www.augustana.ca/rdx/bruneau/documents/PDM%20in%20an%20Intercultural%20context.doc. Retrieved 2007-01-17. ^ Consensus Development Project (1998). "FRONTIER: A New Definition". Frontier Education Center. http://www.frontierus.org/documents/consensus.htm. Retrieved 2007-01-17. ^ a b c Rachel Williams; Andrew McLeod (2006). "Introduction to Consensus Decision Making" (PDF). Cooperative Starter Series. Northwest Cooperative Development Center. http://www.nwcdc.coop/Resources/CSS/CSSIntro2Consensus.pdf. Retrieved 2007-01-17. ^ Dorcas; Ellyntari (2004). "Amazing Graces' Guide to Consensus Process". http://www.webofoz.org/consensus.shtml. Retrieved 2007-01-17. ^ a b "The Consensus Decision Process in Cohousing". Canadian Cohousing Network. http://www.cohousing.ca/consensus.htm. Retrieved 2007-01-28. ^ The Common Wheel Collective (2002). "Introduction to Consensus". The Collective Book on Collective Process. http://www.geocities.com/collectivebook/introductiontoconsensus.html. Retrieved 2007-01-17. ^ Alan McCluskey (1999). "Consensus building and verbal desperados". http://www.connected.org/govern/consensus.html. Retrieved 2007-01-17. ^ Harvey, Jerry B. (Summer 1974). "The Abilene Paradox and other Meditations on Management". Organizational Dynamics 3 (1): 63. doi:10.1016/0090-2616(74)90005-9. ^ "Consensus Team Decision Making". Strategic Leadership and Decision Making. National Defense University. http://www.au.af.mil/au/awc/awcgate/ndu/strat-ldr-dm/pt3ch11.html. Retrieved 2007-01-17. ^ "How Does the Grand Council Work?". Great Law of Peace. http://sixnations.buffnet.net/Great_Law_of_Peace/?article=how_does_grand_council_work. Retrieved 2007-01-17. ^ M. Paul Keesler (2004). "League of the Iroquois". Mohawk - Discovering the Valley of the Crystals. http://www.paulkeeslerbooks.com/Chap5Iroquois.html. Retrieved 2007-01-18. ^ Bruce E. Johansen (1995). "Dating the Iroquois Confederacy". Akwesasne Notes. http://www.ratical.org/many_worlds/6Nations/DatingIC.html. Retrieved 2007-01-17. ^ United Nations (2002). "Consensus Tradition can Contribute to Conflict Resolution, Secretary-General Says in Indigenous People's Day Message". Press release. http://www.un.org/News/Press/docs/2002/sgsm8332.doc.htm. Retrieved 2007-01-17. ^ David Graeber; Andrej Grubacic (2004). "Anarchism, Or The Revolutionary Movement Of The Twenty-first Century". ZNet. http://www.zmag.org/content/showarticle.cfm?ItemID=4796. Retrieved 2007-01-17. ^ Sanderson Beck (2003). "Anti-Nuclear Protests". Sanderson Beck. http://san.beck.org/GPJ29-AntiNuclearProtests.html. Retrieved 2007-01-17. ^ a b Ethan Mitchell (2006). "Participation in Unanimous Decision-Making: The New England Monthly Meetings of Friends". Philica. http://www.philica.com/display_article.php?article_id=14. Retrieved 2007-01-17. ^ Abe J. Dueck (1990). "Church Leadership: A Historical Perspective". Direction. http://www.directionjournal.org/article/?676. Retrieved 2007-01-17. ^ Ralph A Lebold (1989). "Consensus". Global Anabaptist Mennonite Encyclopedia Online. Global Anabaptist Mennonite Encyclopedia Online. http://www.gameo.org/index.asp?content=http://www.gameo.org/encyclopedia/contents/C6667ME.html. Retrieved 2007-01-17. ^ Maine.gov. What is a Consensus Process? State of Maine Best Practices. Retrieved on: 2009-03-01. ^ "The Tao of IETF: A Novice's Guide to the Internet Engineering Task Force". The Internet Society. 2006. http://www.ietf.org/tao.html. Retrieved 2007-01-17. ^ Andrew Updegrove (August 31, 2007). "The ISO/IEC Voting Process on OOXML Explained (and What Happens Next)". http://consortiuminfo.org/standardsblog/article.php?story=20070831151800414. Retrieved 2008-09-13. ^ "Color Cards". Mosaic Commons. http://www.mosaic-commons.org/node/44. Retrieved 2007-01-17. ^ Jan H; Erikk, Hester, Ralf, Pinda, Anissa and Paxus. "A Handbook for Direct Democracy and the Consensus Decision Process" (PDF). Zhaba Facilitators Collective. http://www.zhaba.cz/uploads/media/Shared_Path.pdf. Retrieved 2007-01-18. ^ "Hand Signals" (PDF). Seeds for Change. http://seedsforchange.org.uk/free/handsig.pdf. Retrieved 2007-01-18. ^ "Guide for Facilitators: Fist-to-Five Consensus-Building". http://www.freechild.org/Firestarter/Fist2Five.htm. Retrieved 2008-02-04. "Some Materials on Consensus." Quaker Foundations of Leadership, 1999. Richmond, Indiana: Earlham College. "TraitÉ du Savoir-Vivre for the Occupy Wall Street Generations." Al Giordano, 2011. The Field. "The Tyranny of Structurelessness." Jo Freeman.